1. Why do we lose flexibility with age? 2. Why are some people more flexible than others? 3. Why are men stiffer than women? 4. Why does stretching not improve my flexibilty? Once formed, these microfibers not only do not go away, they tend to accumulate over time, making people stiffer as they get older. Microfibers cannot be released by stretching, which is why people who have them find that stretching does not improve their flexibility. The propensity to form microfibers is genetic. Some people form them more readily than others, which is why some people are stiffer than others. Thus, you have two factors that make for stiffness: genetics and personal history. Microfibers forming inside the muscles is well-known in the sports medicine community (enter 'Stauber WT' in PubMed for published articles). These microfibers actually delay the recovery process when muscles are impacted or overused. There are a number of drugs being investigated now in clinical trials that will hopefully reduce the formation of microfibers within the muscles after impacts or oversue. Unfortunately, they will not be able to reduce microfibers that have already formed. The Somax hypothesis is that microfibers also form between the layers of connective tissue that surround the muscles. These membranes are normally smooth, allowing the muscles to slide past each other, just as cartilage (another form of connective tissue) allows the bones to move on each other within a joint. We believe that these microfibers prevent the muscles from sliding past each other in order to immoblize the area so that it can recover. They are nature's internal cast. Once the muscles have recovered, the microfibers not only do not go away, they tend to accumulate over time, making people stiffer with age. As we release these microfibers with Microfiber Reduction, the muscles can immediately slide and stretch. Microfibers are a mild form of scar tissue that develop in the connective tissue between the muscles, binding them together and preventing them from stretching . It is the accumulation of these microfibers over time that makes people get stiffer as they get older. Every muscle in the body is surrounded by a thin membrane of connective tissue, just like the skin around a sausage. Normally, this connective tissue is smooth. With the aid of a special lubricant, it facilitates the muscles sliding smoothly past each other, which they must do to stretch or contract. In the drawing below, you can see how pervasive this connective tissue is throughout the whole body. 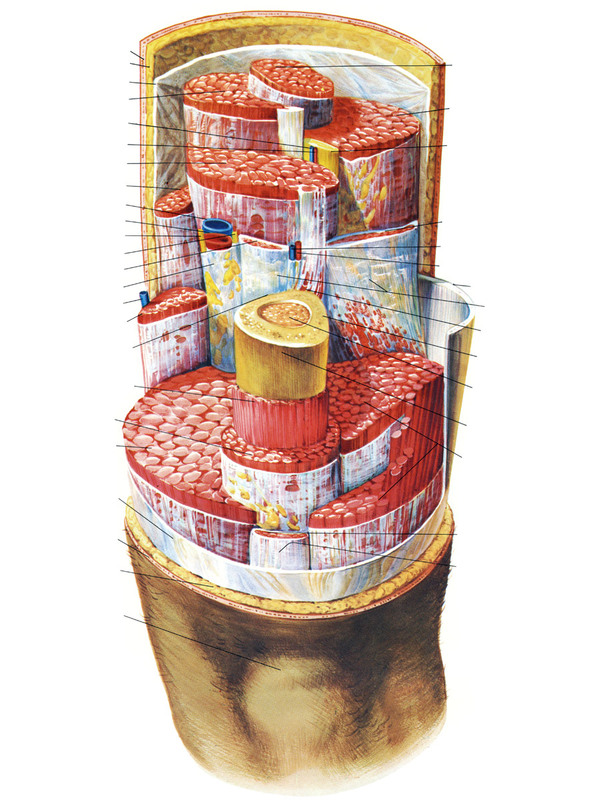 The muscles are in red and the white membranes around each and every muscle are connective tissue. The role of the connective tissue is to facilitate movement between the muscles. Microfibers form in between the connective tissue membranes to immobilize the muscles so that they can recover from impact and overuse. Once the muscles have recovered, the microfibers not only do not go away, they tend to accumulate over time, making people stiffer as they get older. Microfibers are not limited to the elderly. Many young children have them. They find they are stiffer than their friends are and unable to improve their flexibility with stretching. While you may easily be able to touch your toes, this is not a very important range. 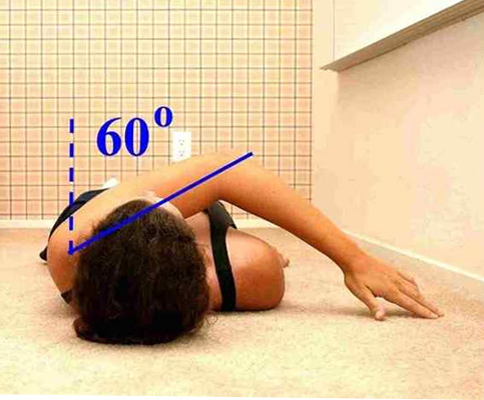 You may lack flexibility in more important ranges such a breathing, or sport-specific ranges. You can order articles describing these ranges and how to measure and stretch them. Stress can be physical, such as impacts, accidents, illness, or over-use. It can be mechanical, such as carrying briefcases, golf bags and backpacks on one side. Or it can be job stress, the stress of grad school, or the stresses associated with running a business. In more stressful situations such as football impacts, we immediately release endorphins to prevent shock and dull pain. Endorphins are 400 times stronger than morphine, and are released directly into the brain. As a result, we are often unaware of either the severity of the impact, or how much we have tensed our muscles. This is a common phenomenon. While watching post-game films, professional football players report that they are often surprised to see the hits they have taken during the game. They simply did not remember these impacts, as their brains were flooded with endorphins. Tension does not necessarily leave once the stress has past. As muscles tense, microfibers (small connective tissue fibers), immediately form. The microfibers are like an internal cast. They form to immobilize the area so that it can recover. Connective tissue, however, is not very bright. It can't tell the difference between an impact in soccer and just having a bad day. As soon as the muscles tense, microfibers form. Once the microfibers have formed, they cannot be released by stretching. And once the microfibers have formed, they not only don't go away, they tend to accumulate over time. This accumulation of microfibers over time is what makes people get progressively stiffer as they get older. Microfibers restrict movement. They are so small that they cannot be felt. The only way to know if you have microfibers is to measure your flexibility and then stretch. If there is no measurable improvement, your muscles are locked together with microfibers. As microfibers are released by Microfiber Reduction (MR), improvement is immediate and dramatic. It feels just like someone has unlocked that area. You feel a freedom of movement that you only dreamed about. This new flexibility will improve your sports mechanics, posture and ability to expand your chest. Once the microfibers are released, they are gone for good. However, new microfibers may form if there is residual tension in the muscles. For this reason, we combine Microfiber Reduction with our Tension Reduction exercises. For most clients we also recommend our Stress Reduction program to get rid of any lingering stress. By restricting movement, microfibers change the way athletes move. This causes athletes to be inefficient in their sport. Here are just a few examples of the improvement in flexibility beyond what our clients were able to get with stretching alone. For more examples, go to clients. The fee for Microfiber Reduction is $350 an hour at our headquarters in Tiburon, CA, as part of our flexibility and video analysis program. We recommend you start with our Day at Somax. Minimum program is 30 hours. For an additional 30%, our performance specialists can travel to your area for a minimum of 60 hours in two weeks in the US. For an additional 50% and a minimum of 120 hours in four weeks we can travel overseas. All fees are to reserve your time and are non-refundable. Microfiber Reduction is also available with some camps and team programs. The length of program you will need will depend on your current state of flexibility and can be determined by measuring certain key ranges of motion. Please contact us for more information. You can see how Microfiber Reduction (MR) has improved flexibility and athletic performance by going to clients. If you have questions about Microfiber Reduction, or want to schedule an appointment, please contact us.